In the latest report from the Department of Defense 2019 Missile Defense Review the Air Force is proposing to use the F-35 to shoot down intercontinental ballistic missiles, preferably in the early boost phase of the launch of ICBMs against the United States. In this regard the Air Force wants to exploit the advanced radars and electronics of the F-35, adapt the SM-3 interceptor missile, and hit the ICBMs before they can deploy countermeasures or decoys. The idea is take some of the pressure off the Ground-based Mid-Course Interceptors based primarily in Alaska which potentially could be overwhelmed in a missile strike but also to enhance the chance of a kill against ICBMs launched against the United States. There are a number of murky issues surrounding this proposal. At the geopolitical level one would assume that the focus of the Air Force Plan is to head off a strike either from North Korea or China since the majority of the Ground-based interceptors are in Alaska, with only a few at Vandenberg AF Base in California. Overall the US has paid little attention to any missile defense protections from China, on the assumption that China’s long range nuclear missile capability was far smaller than in the United States, suggesting China would never attempt an attack on the United States. But the US posture towards China seems to be changing as China continues a build up of strategic weapons and is increasingly well positioned to threaten US allies and friends. The Air Force wants to increase the number of Ground Mid-course Based Interceptors (GBI) from 44 in Alaska to 64 and improve the technology of the interceptor missile. (The request for 20 additional interceptors was first made in 2017 and is again proposed for 2019.) Whether North Korea will remain a tangible threat depends on the success or failure of the denuclearization talks now entering their second stage, but North Korea’s ICBM capability is in any case small at present. It may also be the case that confidence in the GBI is not so strong. GBI tests have failed more than they have worked, and against a real threat it is anyone’s guess if the system will work. Overall the Navy’s SM-33 air defense missile has tested better, so the proposal may be aimed at offsetting what some regard as an “iffy” defense capability deployed in Alaska and California. The SM-3 itself was not designed for air launch. Considerable testing would be needed to see if the interceptor missile can be adapted. What makes the Air Force proposal somewhat suspicious is that there are other platform choices that make more sense. These include three strategic bombers and one strategic fighter bomber, the F-22. While the numbers have been disputed, the hourly operating cost of the F-35 is $67,550. In the case of being fitted with an SM-3 (assuming it is possible), it can only carry one. By contrast, the B1-B bomber, which has a low radar cross section but is not a stealth aircraft, can carry 125,000 pounds of ordinance. The SM-3 currently is said to weight around 3,000 pounds suggesting it can carry a large number of SM-3 missiles. What the B1-B bomber may be missing is the right electronics, but using the features of the F-35 it should not be an overwhelming problem to apply these to the B1-B (which already has rather sophisticated systems onboard). If we say that the B1-B could easily carry only five SM-3 interceptors, the cost per hour per missile would be around $12,206 (where the hourly cost for operating the B1-B is $62,027, more than $5,000 less than the F-35 but with far greater range and loiter ability, then divide 5 into the hourly operating cost of the aircraft for a reasonable comparison). There are 100 B-1B aircraft in service. Each aircraft has a range of over 5,000 miles and can be air to air refueled. While these aircraft are getting old, there isn’t any reason why they could not be used for the SM-3, if an air launched SM-3 is viable. Another choice would be the stealthy B-2 bomber. It is stealthy but also expensive to operate but could carry a large SM-3 load. 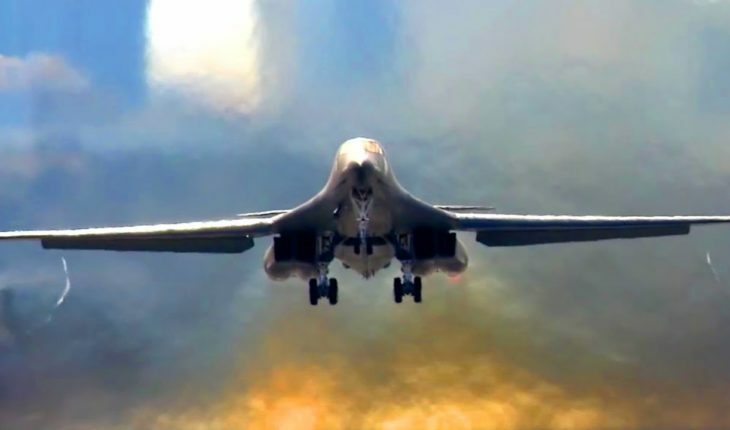 Compared to the B-1B the B-2 costs a whopping $130,159 to operate. Because it still has a strategic nuclear role (the B1-B does not), it does not make sense to use it for a prospective SM-3 platform. Then there is the venerable (and rapidly aging away) B-52 which remains in service and is especially good at low level operations. It costs about $70,400 an hour to operate and can carry a very large weapon’s load. At issue for the B-52 is that it is slow, compared to the B1-B and its age makes any significant investment these days in the B-52 very chancy. Finally there is the F-22. Around 119 are still in service and it is the best stealth aircraft we have. It costs $58,059 to operate, making it less expensive than the F-35. Whether an SM-3 could actually be fitted inside the F-22 is unknown (and may prove difficult). In any case the Air Force is actually cannibalizing some F-22′s to keep the fleet that remains operational. So the F-22 is not a good candidate. There are still other choices such as the F-15 that could carry the SM-3 on its center line. There has been talk about upgrading the F-15 or even a new generation of the aircraft that would have electronics similar to the F-35. If stealth is not needed to get the job done, the F-15 might do, but it is a single shot platform like the F-22 and F-35. It isn’t clear why the Air Force picked the F-35, but it may be they are trying to do everything they can to keep Congress convinced it is a useful platform and worth the tremendous investment involved in producing these airplanes. And while money would be saved if the existing electronics could be adapted to the SM-3 and if the SM-3 is viable mounted externally (meaning the F-35 is no longer stealth), it isn’t a very good choice where only a limited number of these planes could be dedicated to patrol the skies in a missile defense role. The B1-B seems a better idea.